This was one of the cakes that leapt out at me when first perusing Dan Lepard’s Short & Sweet and I was keen to make it as soon as possible – which I did back in October and have left it so long that Dom has beaten me to it. AND his looks brilliant!!! 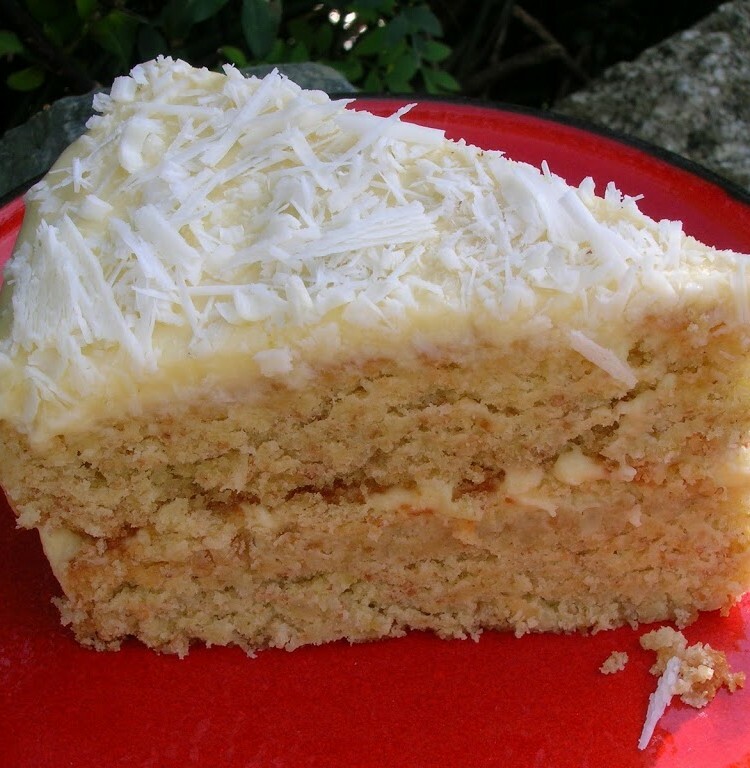 I’ve not come across cakes made with coconut milk very often and found it quite intriguing. I was hoping to include it as one of the Open House cakes, but in the end it just wasn’t feasible, either the original or a cupcake version I had been toying with. So, having bought the necessary ingredients, I made a version of it the following weekend for us anyway. It’s not strictly a chocolate cake, but I was planning to incorporate chocolate somehow as well as use up some odds and sods left over from the big bake. Placed 50g desiccated coconut in a small bowl. Warmed 160ml coconut milk up in a pan. Poured this over the coconut. Added 1 tsp vanilla extract and 50ml white rum, then covered the bowl and left for a couple of hours. Creamed 250g unsalted butter with 300g cardamom sugar (caster) until light and fluffy. Beat in 4 smallish hens eggs, alternating with a little of the flour. Added 275g twice sifted flour (100g wholemeal, 175g white), 2 tsp baking powder and 1/4 tsp bicarb of soda alternately with the coconut mixture. Divided between two 22 cm round cake moulds and baked for 30 mins at 180C. Squeezed half an orange over the two cakes whilst hot (it was meant to be lime and rum, but I didn’t have any lime and forgot the rum). Left to cool for 10 minutes then turned out onto racks to cool completely. Found a small dish of buttercream icing lurking in the fridge. Beat this up with 150g mascarpone and one of my jars of apple & lemon curd. I’d also meant to add 100g melted white chocolate, but I forgot! Sandwiched the cakes together with the apple/lemon mascarpone then spread the rest over the top and around the sides. Topped with 40g white chocolate shavings. Despite some of the ingredients I forgot, they couldn’t have been essential, because this turned out to be a really lovely cake. When asked his thoughts, CT helpfully stated “it tastes like a homemade cake”. What he actually meant by that, was it tasted like a real cake made by a real person and was utterly delicious. It was not overpoweringly coconutty, but the rum came through clearly and pleasantly. It was moist and had a good firm chewy texture. The apple cream, mascarpone filling and icing complemented it well and was delicious in its own right. For some reason, it reminded me of a really good banana cake – but without the banana! You’ve got me laughing now. I love the way you seem to just bundle everything together (“I forgot this”, “I didn’t have that”) but it always turns out fantasic. This cake looks great. I gave my copy of Dan’s book to sister – its time I got it back. This looks absolutely fabulous Choclette and I am a sucker for coconut in cakes! Love CT’s review too and rum in cakes also get my vote! SUCH a pretty cake and your photos are lovely. This looks delicious and very homemade 🙂 Just got a copy of short and sweet on loan, cant wait to read through it later. Laura – Glad to hear you’ve got your copy now – now what, I wonder are you going to make first? Karen – thank you. I really like the slightly chewy texture that coconut brings and thank you for saying such nice things too. Baking Addict – now that’s good thinking. What do you reckon? I like the idea of using coconut milk in the cake. My mum used to make a nice coconut cake and this reminds me of it. Definitely one to make me salivate! oh it looks lovely, I love the way you’ve covered yours in white chocolate… I think people thought mine was too and they were quite shocked to find out it was slivers of coconut instead!… and at least e get to see inside yours too!… great thing about this post is that I know exactly how good it tastes… wee hee! It looks gorgeous, and the cake looks really moist and light. I love the way you’ve decorated it with white chocolate – really elegant! I would love this cake, but the rest of the tribe aren’t big coconut fans. It looks absolutely splendid, Choc! I’ve been eyeing up this cake in Short & Sweet for a while…your version looks delicious. Love how you’ve managed to sneak some chocolate in there too – you can hardly tell the difference between white chocolate shavings and coconut! you had me at “coconut”! Looks divine! This cake looks soooooo good. I could just eat a slice right now! Corina – yes, it was the coconut milk that appealed to me. Scott – excellent. If I don’t make someone salivate, I’ve failed! Celia – you’ll just have to come over and have a slice with me then. CC – thank you. I have penchant for coconut too. MCB – you’d be very welcome – assuming I had a slice left! Coconut is one of my most favourite things to bake with, glad there is also a use for the tinned stuff too in it! The cake looks really tasty, glad it worked out so well with your alterations! Johanna – he he, things are coming to a pretty pass indeed when I forget chocolate! This looks like a delicious cake and I especially like the addition of using coconut milk to soften the dessicated coconut. Maggie – thank you. That is what appealed to me. I always have coconut milk in the house but I never thought to use it for softening dried coconut – I bet that makes for a moister cake – I like this idea! The cake sounds lovely.